We’re looking for people willing to go up while everyone else is coming down—to rescue men and lead them to the safety of the cross of Christ. The Fellowship of the Red Bandana is offered to men and women who are willing to train, serve, and make a sacrifice to engage every man in America with a credible offer of Christ and the resources to grow. Are you a leader who is willing to go up while others are coming down. If you are, then you are invited to be part of The Fellowship of the Red Bandana. Do you accept? As stories began to emerge from the survivors of the South Tower of the World Trade Center, several mentioned a mysterious young man who stepped out of the smoke and horror to lead them to safety. They did not know who this man was who saved their lives, but this they did remember: Wrapped around his mouth and nose was a red bandanna. For 76 minutes, the man in the red bandanna barked orders, and led people to safety down stairwells. He said, “I found the stairs, follow me.” He carried one woman down fifteen flights of stairs—on his back, while leading others to safety, urged them to keep going down, then headed back up. Upstairs, a badly injured woman was sitting on a radiator when the man with the red bandanna over his face came running across the room and said, “Follow me. I know the way out. I will lead you to safety.” Then he led several survivors to a stairwell that took them to safety. He was never seen alive again. Six months later, on March 19, 2002, the body of the man with the red bandanna was found intact alongside firefighters in a makeshift command center in the South Tower lobby buried under 110 stories of rubble. Slowly the story began to come out. Welles Crowther graduated from Boston College where he played Lacrosse, always carrying his trademark red bandanna. In high school Welles was the kid who would feed the puck to the hockey team’s lowest-scoring player, hoping to give his teammate his first goal. At 16 he became a junior volunteer firefighter, following in his dad’s footsteps. After college he joined Sandler O’Neil and Partners and worked on the 104th floor of the South Tower. He always carried change to give to street people. His dream was to become a firefighter or public servant. On Sept. 11, at the age of 24, Welles Crowther became both, and also a hero — the “man in the red bandanna.” (Compiled from news reports and used with permission by Alison Crowther). We’re looking for people willing to go up while everyone else is coming down—to rescue men and lead them to the safety of the cross of Christ. 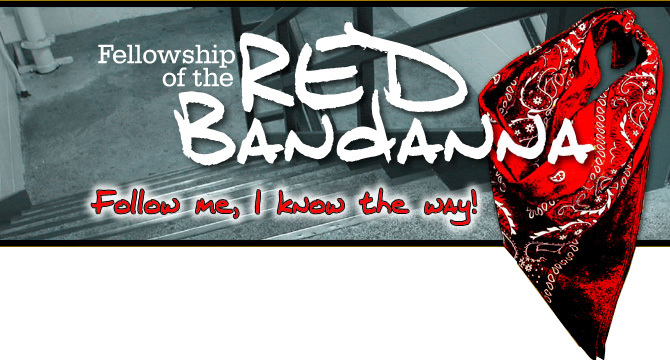 The Fellowship of the Red Bandanna is offered to men and women who are willing to train, serve, and make a sacrifice to engage every man in America with a credible offer of Christ and the resources to grow. Welles was willing: willing to serve and to make a sacrifice for the good of others. He was also prepared: he trained so when the time came he was ready. 25% of Secret Service duty is training— their credo: “repetitive training to overcome the negatives of self-sacrifice. Welles did not miss his moment. He went up while everyone else was coming down. You are someone who has been recognized as willing to go up while others are coming down. It is my privilege and honor to invite you to be part of The Fellowship of the Red Bandanna. Do you accept? I hereby initiate you into The Fellowship of the Red Bandanna by the grace of God and for the glory of Jesus Christ. Superficiality is the curse of our age. . . . The desperate need today is not for a greater number of intelligent people, or gifted people, but for deep people. I tell you that this sweet and loving gaze of God insensibly kindles a divine fire in the soul which is set ablaze so ardently with the love of God that one is obliged to perform exterior acts to moderate it. DISCLAIMER: This website is not associated with the Welles Remy Crowther Charitable Trust or Red Bandana Project curriculum in any way. However, even though we are not associated, Man in the Mirror developed the Fellowship of the Red Bandana content with the knowledge and permission of the Crowther family.